Tav Falco, Arkansas born musician, film maker, actor, author, performance and visual artist, bohemian and raconteur – there is little in the world of “art damage” that he has not turned his hand to in the past thirty five years, but to those involved in rock`n`roll he is probably known best for his work with his Panther Burns. It was back in the late eighties when they emerged – garage blues troubadours of the highest order with a stunning debut “Behind The Magnolia Curtain”. Back then Tav was aided and abetted by the legendary Alex Chilton, Jim Dickinson and Jim Sclavunos to name just a few. They cherry picked the songs from their collective past – the blues in all its hues and added an almost psychotic edge that saw them oft compared to The Gun Club and The Cramps, but in truth Tav’s take on the blues is far more nuanced with a dark depth and allure – here was someone who not just sings it – he lives it and along with fellow occupants of a swampland blues scene honed to perfection in and around Memphis, where a young Tav made his home base. Having signed with Rough Trade I got my first chance to see the band in London not long after the aforementioned album release – a stunning gig, almost chaotic in places and the first time I met the man himself during my time as a scribe for the sadly long gone Sounds weekly paper. I was captivated and remained a fan ever since… now I get a chance to work with the man. Wind on through those decades and in 2015 a whole slew of Tav related activities has everyone bristling with interest. First there was the highly acclaimed premieres in London and Vienna (where Tav is now domiciled) of his brand new movie “Urania Descending” – an art house film noir romp as one critic described it – back in October 2014. That was just the beginning and now as we get into a new year there will be an entire remastered back catalogue of The Panther Burns released, Tav`s award winning “Mondo Memphis” book is updated and republished, there will be a brand new photographic book and a brand new Panther Burns album and extensive touring in support of it. That is where I come in, unleashing “Command Performance” on my nifty little label Twenty Stone Blatt Records – yup, a brand new Panther Burns album, their first for five years and something of a real statement of intent from a man and his band who hit new peaks of performance and showcasing not only Tav`s usual selection of the obscure and the well known from the blues palette but an amazingly broad selection of new original material as well. No resting on laurels either as the album sees the Panther Burns dabble in many new and exciting stylistic adventures… just dig the almost Motown soul of album opener “Breakaway” or the Dylanesque bottleneck shuffle and political bite of “Whistle Blower”. There is all sorts going on here – a bit of Mediterranean shuffle, some surf guitars, a dabble into country and Americana, a touch of 50`s rock-a-billy, some classic garage rock ‘n’ roll beat, one song has an almost James Bond mystery theme to it – there is even a rhumba!! All in all “Command Performance” is a stunningly varied album and astonishingly good fun with real edge to it. 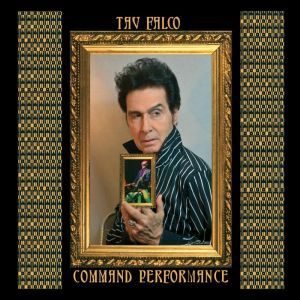 With “Command Performance” Tav Falco & The Panther Burns set out their stall – the recent live shows have been incendiary, whilst his contemporaries fade into history Tav Falco is still out there – a man with something to say and some serious rock and rolling to be done, no nostalgia trip just raw vital music for now ! !